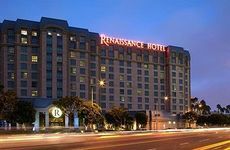 Find Renaissance Los Angeles Airport Hotel deals, discounts and special offers. Newly remodeled electic Renaissance Montura has 499 suites and rooms, outdoor heated pool, and dining. Near LAX. Palomar features 264 guestrooms, in-room spa treatments, outdoor pool, state-of-the-art fitness center; in Westwood. Hilton boasts 134 contemporary styled rooms with flat-screen TVs, full-service spa, rooftop pool, in Financial District. The 1,234 room Hilton features a pool, fitness center, and is located near LAX. Adjacent to the freeway at the entrance to Universal Studios, Hilton rooms have flat-screen TVs and panoramic views. Luxurious family-friendly hotel in the L.A. suburbs near attractions, featuring a full spa, outdoor pool and steam room. Marriott at LAX features 985 luxurious rooms, 19 suites, outdoor heated pool and is 100% smoke-free. The LA Hotel Downtown has 400 guestrooms with floor to ceiling view windows; located in Finanical District. Set in downtown LA, the Millennium Biltmore offers 683 rooms, a Roman-style indoor pool and health club. Asian influences and neoclassic overtones adorn the 453 room Omni in downtown LA. Also features a full-service spa. Stylish, waterfront Ritz-Carlton with marina views features award-winning dining, & full-service spa. Sheraton Gateway, near LAX, has 802 guestrooms, state-of-the-art fitness center, heated outdoor pool and whirlpool. In the financial district, 485-room Sheraton has fine and casual dining, as well as access to fitness center. French style and Hollywood glamour are fused in Sofitel which includes full-service spa, dining, near Beverly Center. A convention hotel in the Financial District, Westin has a revolving lounge with panoramic views, & shopping atrium.